The Ultimate All-Purpose Formula! 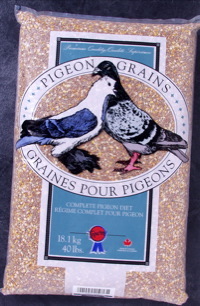 #1 pigeon food - with it's high protein, high energy and excellent fibre ratio-makes a wonderful racing mixture. Popcorn, small white peas and red Milo allow this formula to double as a raising food. #1 is suitable for almost ALL Pigeons of all ages. This is a superb choice whether you are conditioning your Homers for the breeding season or the flying season. Due to it's smaller-sized grain, #1 is the right choice for Tipplers, Fans, Owls or Medians. #1 may not be suitable for Roller pigeons throughout the flying season due to it's high corn ratio. Popcorn, wheat (hard western), white Peas (small), milo-Red, tares, maple and/or austrian peas, buckwheat.